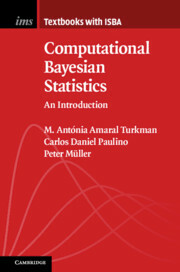 This entry was posted on February 1, 2019 at 12:19 am and is filed under Books, Statistics with tags ABC, Bayes factor, Bayesian model selection, Bayesian p-values, Bayesian paradigm, Bayesian textbook, BayesX, book review, Cambridge University Press, coda, computational Bayesian methods, cup, Gibbs sampling, information criterion, INLA, JAGS, Jeffreys prior, Kalman filter, Laplace approximation, Likelihood Principle, MCMC, Metropolis-Hastings algorithm, model assessment, Monte Carlo Statistical Methods, OpenBUGS, R, sequential Monte Carlo, STAN, subjective versus objective Bayes. You can follow any responses to this entry through the RSS 2.0 feed. You can leave a response, or trackback from your own site.